The facial nerve is the seventh cranial nerve, or simply CN VII. It emerges from the pons of the brainstem, controls the muscles of facial expression, and functions in the conveyance of taste sensations from the anterior two-thirds of the tongue. The nerves typically travels from the pons through the facial canal in the temporal bone and exits the skull at the stylomastoid foramen. It arises from the brainstem from an area posterior to the cranial nerve VI (abducens nerve) and anterior to cranial nerve VIII (vestibulocochlear nerve). The motor part of the facial nerve arises from the facial nerve nucleus in the pons while the sensory and parasympathetic parts of the facial nerve arise from the intermediate nerve. From the brain stem, the motor and sensory parts of the facial nerve join together and traverse the posterior cranial fossa before entering the petrous temporal bone via the internal auditory meatus. Upon exiting the internal auditory meatus, the nerve then runs a tortuous course through the facial canal, which is divided into the labyrinthine, tympanic, and mastoid segments. The labyrinthine segment is very short, and ends where the facial nerve forms a bend known as the geniculum of the facial nerve ("genu" meaning knee), which contains the geniculate ganglion for sensory nerve bodies. The first branch of the facial nerve, the greater superficial petrosal nerve, arises here from the geniculate ganglion. The greater petrosal nerve runs through the pterygoid canal and synapses at the pterygopalatine ganglion. Post synaptic fibers of the greater petrosal nerve innervate the lacrimal gland. In the tympanic segment, the facial nerve runs through the tympanic cavity, medial to the incus. The pyramidal eminence is the second bend in the facial nerve, where the nerve runs downward as the mastoid segment. In the temporal part of the facial canal, the nerve gives rise to the stapedius and chorda tympani. The chorda tympani supplies taste fibers to the anterior two thirds of the tongue, and also synapses with the submandibular ganglion. Postsynaptic fibers from the submandibular ganglion supply the sublingual and submandibular glands. Upon emerging from the stylomastoid foramen, the facial nerve gives rise to the posterior auricular branch. The facial nerve then passes through the parotid gland, which it does not innervate, to form the parotid plexus, which splits into five branches innervating the muscles of facial expression (temporal, zygomatic, buccal, marginal mandibular, cervical). Greater petrosal nerve – It arises at the geniculate ganglion and provides parasympathetic innervation to several glands, including the nasal glands, the palatine glands, the lacrimal gland, and the pharyngeal gland. It also provides parasympathetic innervation to the sphenoid sinus, frontal sinus, maxillary sinus, ethmoid sinus and nasal cavity. This nerve also includes taste fibers for palate via lesser palatine nerve and greater palatine nerve. Communicating branch to the otic ganglion – It arises at the geniculate ganglion and joins the lesser petrosal nerve to reach the otic ganglion. By locating the posterior facial vein at the inferior aspect of the gland where the marginal branch would be seen crossing it. The cell bodies for the facial nerve are grouped in anatomical areas called nuclei or ganglia. The cell bodies for the afferent nerves are found in the geniculate ganglion for taste sensation. The cell bodies for muscular efferent nerves are found in the facial motor nucleus whereas the cell bodies for the parasympathetic efferent nerves are found in the superior salivatory nucleus. In addition, the facial nerve receives taste sensations from the anterior two-thirds of the tongue via the chorda tympani. Taste sensation is sent to the gustatory portion (superior part) of the solitary nucleus. General sensation from the anterior two-thirds of tongue are supplied by afferent fibers of the third division of the fifth cranial nerve (V-3). These sensory (V-3) and taste (VII) fibers travel together as the lingual nerve briefly before the chorda tympani leaves the lingual nerve to enter the tympanic cavity (middle ear) via the petrotympanic fissure. It joins the rest of the facial nerve via the canaliculus for chorda tympani. 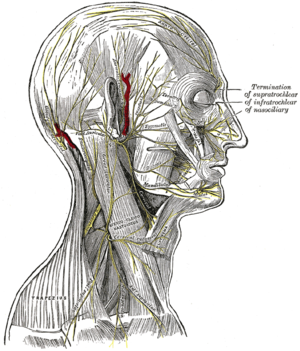 The facial nerve then forms the geniculate ganglion, which contains the cell bodies of the taste fibers of chorda tympani and other taste and sensory pathways. 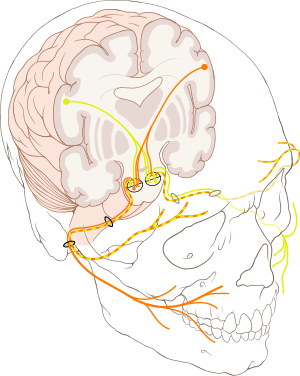 From the geniculate ganglion, the taste fibers continue as the intermediate nerve which goes to the upper anterior quadrant of the fundus of the internal acoustic meatus along with the motor root of the facial nerve. The intermediate nerve reaches the posterior cranial fossa via the internal acoustic meatus before synapsing in the solitary nucleus. People may suffer from acute facial nerve paralysis, which is usually manifested by facial paralysis. Bell's palsy is one type of idiopathic acute facial nerve paralysis, which is more accurately described as a multiple cranial nerve ganglionitis that involves the facial nerve, and most likely results from viral infection and also sometimes as a result of Lyme disease. Iatrogenic Bell's Palsy may also be as a result of an incorrectly placed dental local-anesthetic (Inferior alveolar nerve block). Although giving the appearance of a hemi-plegic stroke, effects dissipate with the drug. When the facial nerve is permanently damaged due to a birth defect, trauma, or other disorder, surgery including a cross facial nerve graft or masseteric facial nerve transfer may be performed to help regain facial movement. Facial nerve decompression surgery is also sometimes carried out in certain cases of facial nerve compression. Voluntary facial movements, such as wrinkling the brow, showing teeth, frowning, closing the eyes tightly (inability to do so is called lagophthalmos), pursing the lips and puffing out the cheeks, all test the facial nerve. There should be no noticeable asymmetry. Lower motor neuron lesions can result in a CNVII palsy (Bell's palsy is the idiopathic form of facial nerve palsy), manifested as both upper and lower facial weakness on the same side of the lesion. ^ a b "The Facial Nerve (CN VII)". TeachMeAnatomy. 2013-09-04. Retrieved 2018-05-04. ^ Gupta, Sachin; Francine Mends; Mari Hagiwara; Girish Fatterpekar; Pamela C. Roehm (2013). "Imaging the Facial Nerve: A Contemporary Review". Radiology Research and Practice. 2013: –248039. doi:10.1155/2013/248039. ISSN 2090-1941. Retrieved 2015-02-07. ^ PhD, Richard S. Snell MD (2011). Clinical Anatomy by Regions (Ninth ed.). Philadelphia, Pa.; London: LWW. ISBN 9781451110326. ^ Singh, Vishram. Textbook of Clinical Neuroanatomy (2nd ed.). p. 104. ^ Dudek, Ronald W. (2014). BRS Embryology (Sixth ed.). LWW. ISBN 9781451190380. ^ Moore, Keith L.; T. V. N. Persaud; Mark G. Torchia (2011). The Developing Human: Clinically Oriented Embryology with Student Consult Online Access, 9th Edition (9th ed.). Philadelphia, PA: Saunders. ISBN 9781437720020. Wikimedia Commons has media related to Nervus facialis.